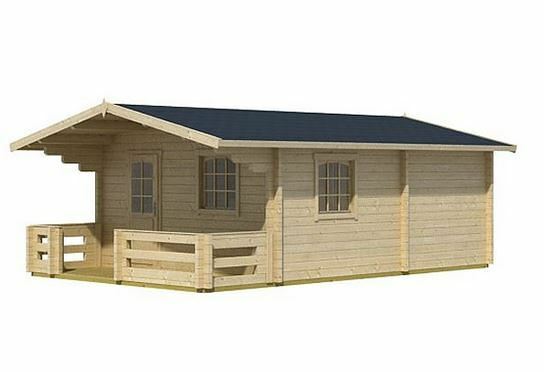 We loved the traditional look of this well proportioned log cabin, and soon found that it comes complete with a whole range of value adding features that despite the large price tag means that it’s well worth considering for people who are looking for a log cabin that offers something a little bit special. From the outside it looks large and imposing, and once inside you find that it has three separate and joined compartments. In effect, it’s more than a garden building, it’s a home from home. There’s also a large veranda area, where you can sit outside and enjoy a barbecue or simply relax in the garden. It’s covered by the overhang of the apex roof, but if the weather takes a turn for the worse you can head inside. Thanks to the effectiveness of the roof and the tight locking tongue and groove cladding, the interior remains reassuringly dry and warm. Four windows allow light to flood into every section, and as they open they can also be used for ventilation. 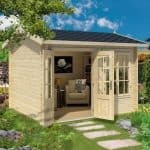 If you’re worried about the security of such a good looking shed, then you’ll be glad to know that a tough key operated locking system is included as standard. This large cabin really caught our eye for two main reasons. 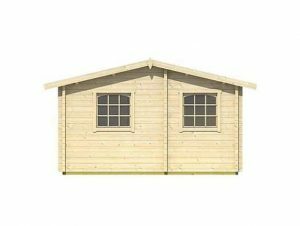 One is its sheer size; we’ve reviewed many log cabins but few that offer the living space that this one does. The second instantly distinguishing factor was the veranda protruding from the front. 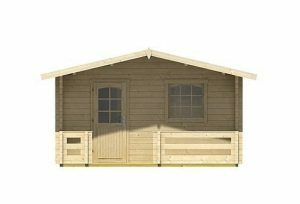 Like the log cabin itself it’s very attractive, and the structure as a whole has a classic and yet very elegant appearance. That’s not to say that these were the only features to grab our attention; also noteworthy was the apex roof. Being made of tongue and groove cladding, which is something we always like in roofs, it’s covered in tough mineral felt giving it excellent weather resistance as it channels rainwater away. It also adds a lot of height, with a peak height of 2.67m and an eaves height of 2.17m. 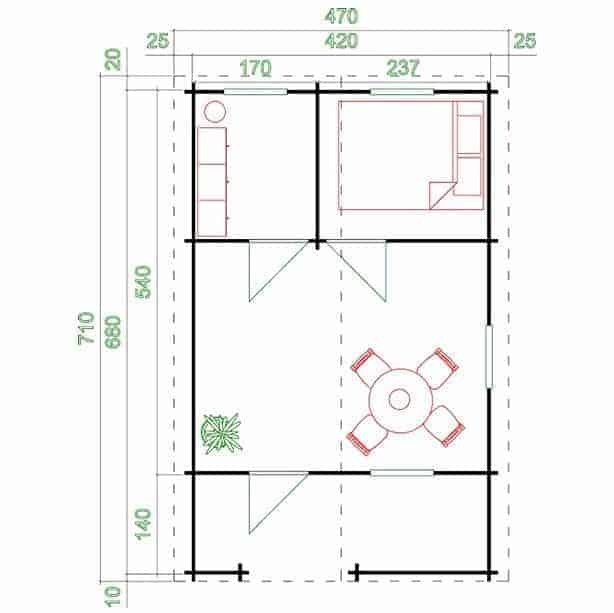 When considering where to position the log cabin, remember that it has an overall width of 4.20m and an overall depth of 5.40m which is then further extended by 1.40m of veranda. 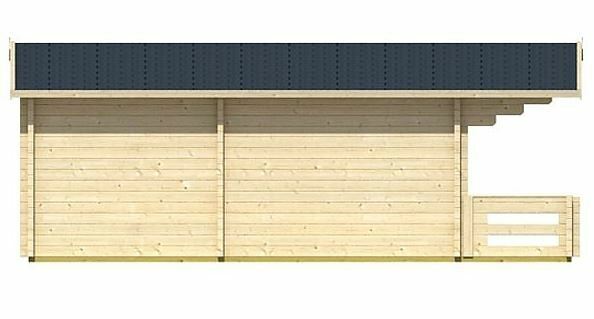 Log cabins are known for the thickness and durability of their cladding, but we were still pleasantly surprised to see that the tongue and groove cladding for these walls has a thickness of 44mm. This is significantly thicker than many we see from other manufacturers, and when combined with the thick roof joist and chalet corner connections it creates a very stable and reassuringly strong building. 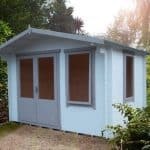 You certainly won’t have to worry about it being placed in area that’s exposed to windy conditions, as you might do with a less sturdy timber building. The floor features the same tongue and groove cladding as the roof, with an adequate thickness of 19mm. The thing we most liked about it, however, is that it’s supported by integrated floor bearers. They lift the floor above the ground and while supporting it they ensure that the floor is protected from the threat of rot causing ground moisture. A 15 year anti-rot guarantee provided by Waltons is welcome testimony to how effective the cladding is at stopping rain getting in. 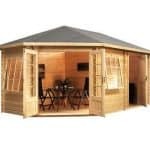 It’s also, however, dependent upon the customer treating the shed with wood preserver immediately after installation and every year after that. We would have preferred to see a pressure treatment applied to the timbers which would have made some of these treatments unnecessary but unfortunately the cabin is supplied in an untreated state. 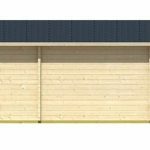 Tubs of good quality Cuprinol wood preserver can be purchased as an optional extra, but you may need a lot of them to treat a building of this size. We liked the single door on the front panel of this cabin, as while it’s a single rather than double door its width of 0.80m is still very generous, as is its height of 1.95m. We were pleased therefore to see that the same door had been used internally to provide access to the two rear compartments. We were also pleased with the four full sized windows, as they mean that each specific area of the interior has a plentiful supply of natural light. They are double glazed and fully opening, which we feel is particularly useful to keep warmth in during winter months, and allow ventilation during summer months. Being made of double glazing the windows do offer some resistance to an attempted break in, although we would have preferred them to be thicker than their 4mm. The most impressive security feature, however, was the integrated key operated mortice lock included on the front door. It’s strong and reliable, but we would still recommend that an alarm system is fitted as well. To make the most of this large cabin, most customers will want to install leisure equipment such as televisions and music centres. It was good to see, therefore, that there are five different solar panel kits available to provide an environmentally friendly supply of electricity. These range from 100W flexible kits to 400W roof mounted kits. 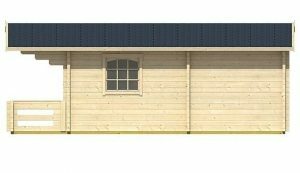 As the timber on the cabin is also sustainably sourced and FSC certified, this is a good choice for people who are concerned about their carbon footprint. From the use of thick logs to create a high quality tongue and groove cladding, to the integrated floor bearers, we found high quality represented throughout this log cabin. The floor joists and tough cladding help to keep water, and therefore rot, at bay, but at this price we would have expected pressure treated timbers to have enhanced this innate durability. 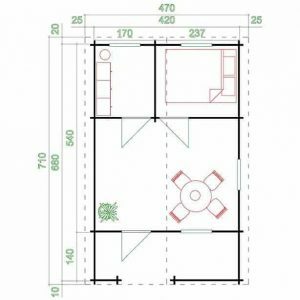 This is a very large cabin, and with a very generous eaves height as well, and a covered veranda area, there’s a lot of space to move around or settle down in. All the fixtures and fittings are included, as is a fairly straightforward set of assembly instructions. Because of its size, however, you can still expect this to take the best part of a day to install, even with a friend’s help. 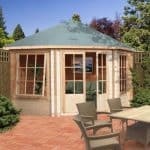 Despite its not inconsiderable price tag, we still feel this represents decent value for money for people who are wanting a large garden building that can fulfill a range of roles. 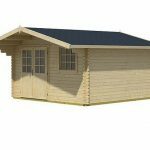 Final Thoughts: If you often have guests to stay and wish that you had somewhere a little larger to house them, or if you’re looking for a cost effective way to extend your living space then this large log cabin could be a perfect solution. With interconnecting doors and windows for every compartment, we can easily imagine this being used as a home office or an extension to the house itself. 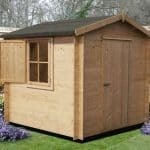 However long a person spends in this log cabin, they’re sure to find it a comfortable and enjoyable experience. Whether you lounge on the veranda, or install and watch a high definition television in the main apartment, this building is capable of providing something for everybody.